Establish the three-dimensional nature of ocean habitats, and expand to idea that there is not a uniform temperature and salinity throughout the ocean. This lesson explores the properties of seawater with depth. The ocean is three-dimensional and physical properties can change with depth as well as horizontal distance. Students translate false color ocean data from a three-dimensional model into a two-dimensional image to help them contextualize the information, and then discuss the changes in ocean properties with depth and their effects on circulation and biology. The density of seawater is affected by temperature, salinity, and depth. Differences in density result in layers of water masses in the ocean. Many layers have distinct characteristics that allow scientists to determine that water mass’ origin and track its movement over time. Salinity has a larger impact on water density than temperature but is less likely to fluctuate a lot over time in the open ocean. Density driven currents, known as thermohaline circulation are one of the major forces mixing seawater vertically in the ocean, and bringing nutrients from the deep sea to the photic zone in biologically productive upwelling zones. Water masses may also have characteristic nutrient concentrations, allowing scientists to study the links between circulation and biology. Real time data from autonomous underwater vehicles allows scientists to study current conditions and changing conditions in near surface water masses. Some of the features commonly studied include the thermocline, a layer where there is a sharp separation in water temperature, and the halocline, similarly the layer where there is a sudden change in salinity. A. Prepare the boxes as directed in the Construction Guide . A. Students will work in groups using the model. 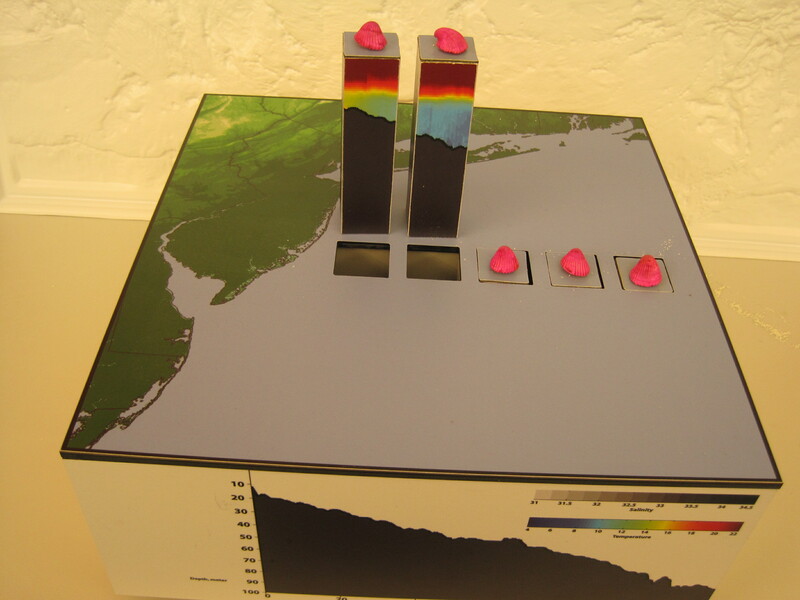 Students are to create a cross section of a seawater property using the data available from the model blocks. B. Review false color with students – what is false color, and what do the colors on the scale you will be using represent. C. Have students select a block to lift. They will place it horizontally on their paper in the correct water column (lining up the bathymetry), and mark the colors on their paper based on the block. Be sure to have them note again what the colors they are using represent. D. Students will replace the first block, and choose another to repeat the process. The goal will be for students to create a cross section of ocean data on their paper by transferring the information from the 3-d blocks into a 2-d format. E. Have students fill in the holes in their data as they color to create the full cross section. Optional: you may have students choose only one or two of the blocks and predict what the full cross section will look like. Then they may use the remaining blocks to check their answers. F. Define thermocline and halocline for students. 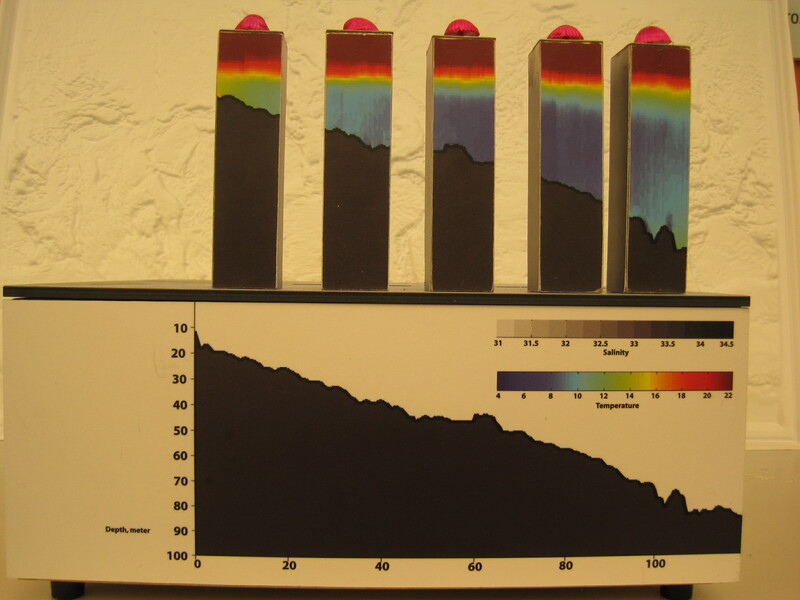 Have them determine whether the data you have used for your model depicts a thermocline or halocline. 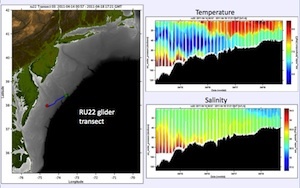 G. You may also give students composite data collected from gliders for each of the four seasons. Challenge them to locate the thermocline or halocline on each data set. 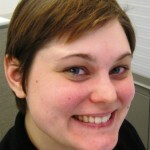 H. Discuss the seasonal differences in thermo/halocline, if any, that students observed. I. Have students discuss what impact their observations might have on organisms living in this region.